Here at Raven Tree, our knowledgable staff are always eager to talk about local wildlife and ways we can better steward– and enjoy!– our shared environment. If you missed us at the shop today, we hope these guides can answer some of your questions in the mean time. Check back for new additions as we grow our shop resource library. We created this quick guide to answer common questions about bats and bat boxes. Click here to view our Bats 101 flyer. Starter guide to choosing the right nest box for you, including common local species’ preferred entrance hole sizes. Click here to view our Nest Boxes 101 flyer. 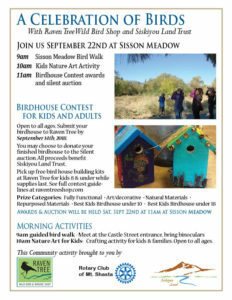 Contest rules and building guidelines for the Raven Tree and Siskiyou Land Trust 3rd Annual Birdhouse Building Contest. 2018 contest entries are now OPEN! Birdhouse entries are due September 15, 2018. Click here to view complete 2018 Birdhouse Building Contest Guidelines.